Roadtrippers.com is a fascinating and wonderful site for those looking to take an adventure, plan a trip or find some ideas on where / what to do along the way. We were amazed by the level of depth, powerful route planning tools and the ease of use to plan a road trip across any part of America encompassed in the site. Roadtrippers.com provides a curated list of destinations that lets you explore the best independent places in America, of which can be browsed and filtered by distance or categories to explore everything on the map. The application tells you how long the trip will take, fuel cost approximations and lets you discover new places for you to checkout while you head toward your destination. A simple site doing a lot of complex things but packed in an elegant and intuitive way. 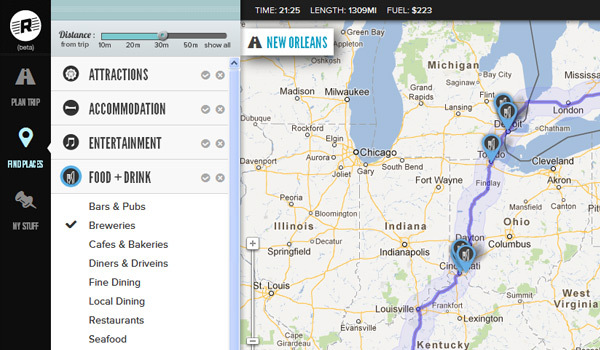 Roadtrippers.com is by far the most features rich and yet simplest road map web application we’ve ever seen. The clean design and simple usability gives you directions, ideas, and way to map out that long awaited trip across America the way it was supposed to be done. Are you planning a road trip soon? Check it out and let us know what you think.